A candymaker in Indiana wanted to make a candy that would be a witness, so he made a Christmas Candy Cane. He incorporated several symbols for the birth, ministry and death of Jesus Christ. He began with a stick of pure white, hard candy. White to symbolize the Virgin Birth and sinless nature of Jesus; and hard to symbolize the Solid Rock, the foundation of the Church, and firmness of the promises of God. The candymaker made the candy in the form of a "J" to represent the precious name of Jesus, who came to earth as our Saviour. It could also represent the staff of the "Good Shepherd" with which He reaches down into the ditches of the world to lift out the fallen lambs who, like all sheep, have gone astray. 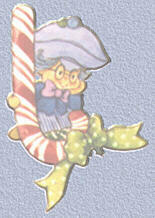 Unfortunately, the candy has become known as a candy cane - a meaningless decoration seen at Christmas time. But the meaning is still there for those who "have eyes to see and ears to hear." I pray this symbol will again be used to witness to the wonder of Jesus and His great love that came down at Christmas and remains the ultimate and dominate force in the universe today.